(Nanowerk News) Tiny balls of nano-sized cellulose fibres added to food reduced fat absorption by up to half in laboratory and animal experiments, report scientists from Nanyang Technological University, Singapore (NTU Singapore) and Harvard University, United States. This discovery could aid in the global battle against obesity, as experiments done in a simulated gastrointestinal tract showed that nanocellulose fibres 100 times smaller than the width of a human hair could cut fat absorption by up to 48 per cent. In animal experiments, rats fed with heavy cream containing nanocellulose absorbed 36 per cent less fats than rats fed with heavy cream alone. Associate Professor Joachim Loo and Associate Professor Ng Kee Woei from NTU's School of Materials Science and Engineering, together with senior author of the study, Associate Professor Philip Demokritou, from the Harvard T.H. Chan School of Public Health, discovered how nanocellulose can bind and trap fat molecules known as triglycerides. Typically, digestive enzymes in the gut will break down triglycerides into fatty acids, which are absorbed by the small intestines and converted to fat by the human body. However, when triglycerides are trapped in nanocellulose fibres - like how cotton balls absorb oil - enzymes involved in breaking down triglycerides for fat absorption are less effective, thus reducing the amount of fatty acids that can be absorbed by the body. Published in the scientific journal ACS Nano ("Reducing Intestinal Digestion and Absorption of Fat Using a Nature-Derived Biopolymer: Interference of Triglyceride Hydrolysis by Nanocellulose"), this new method of using nanocellulose fibres as fat blockers has been granted a US provisional patent, jointly filed by Harvard and NTU. Assoc Prof Ng Kee Woei, a biomedical engineer and materials scientist, said their finding reinforces the conventional wisdom that eating a high fibre diet is good for health. "We've known for a long time that fibre in the diet has positive health benefits but what we have shown now, is that in animal experiments, fibres at the nanoscale are much more effective at reducing fat absorption than in its bulk form," Assoc Prof Ng said. In experiments, 1 mg of nanocellulose was added to 100mg of heavy cream, a ratio of 1:100. Prof Ng thinks that if more nanocellulose was added, it could have absorbed and trapped a larger percentage of fat. "Nanocellulose could be used as food additives or supplements that could help to mitigate fat absorption for certain groups of people, as the concentration can be adjusted for different applications. We look forward to establishing whether this will be safe and effective for people to take." Assoc Prof Joachim Loo, a scientist researching on nanomaterials said cellulose is categorised by the US Food & Drug Administration as a Generally Regarded As Safe (GRAS) material as it is found in all plants. 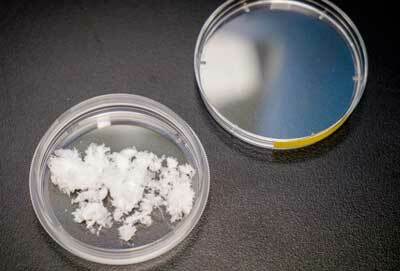 Nanocellulose can be easily produced by grinding cellulose into extremely fine powder. "In our study, three types of nanocellulose were compared to commercially available fat-reducing options, and all of them performed much better in the amount of fats they trapped," Assoc Prof Loo said, although he highlighted that more studies are still needed to determine why the three had better performance. Professor Philip Demokritou, Director of Harvard's Center for Nanotechnology and Nanotoxicology, said the discovery is like "having your cake and eating it too". To him, the most exciting aspect is that fat absorption can be curbed simply through the use of a nanoscale material made of naturally-obtained fibres derived from plants, engineered using mechanical means without any chemicals. "I'm a believer that we should learn more from nature and use more nature-inspired and derived materials," he said. "There's 4 billion years of free R&D there, and instead we always look toward chemicals." Giving an independent comment from the medical perspective, Dr Terence Tan, Head, Advanced Medicine Oncology Centre in Singapore, said: "To date, there is sufficient evidence to show that the absence of excess body fat has a cancer-preventive effect, and lowers the risk of developing thirteen different types of cancers including common cancers such as colorectal and post-menopausal breast cancers. "Avoidance of weight gain in the form of excess body fat is therefore an important strategy in our fight against cancer. Excess fat in our food can easily tip the scale towards an excess of energy intake over energy expenditure, which in turn drives weight gain over time," added Dr Tan, a cancer specialist researching on nanotechnology in food for healthier living and cancer prevention. "This new nature-derived nanocellulose technology has the potential of reducing digestion and absorption of excess fat from our food without compromising on quality and taste, and is very exciting and promising. I look forward to the further evaluation of this technology in animals and humans to validate the findings of this study." Moving forward, the NTU and Harvard scientists will continue to probe the toxicological profile of nanocellulose to examine its safety for consumption in large amounts in further animal trials.